Essays written by Ken Schles are noted here and aggregated on his blog Seeing Images, Seeing Things. Notices and events are also listed on FaceBook. (FaceBook postings tend to be current). 2018 June Book release "The Photograph That Took the Place of a Mountain" by Taco Hidde Bakker. A chapter in conversation with the writer. 2016 November 18 The Diane Arbus List: 9 Photographers Discuss the Legend's Early Days TIME magazine, by Jason Eskenazi. 2016 October 28 -- 2017 February 5 Centro José Guerrero New York in Photobooks. A study of 48 classic photobooks focused on New York, capital of the twentieth century, the most photogenic and photographed city in history. Included, among others are Berenice Abbott's Changing New York, Weegee's Naked City, Roy Decarava and Langston Hughes' The Sweet Flypaper of Life, Helen Levitt's A Way of Seeing, East 100th Street and Subway by Bruce Davidson, Invisible City by Ken Schles and Here is New York: A democracy of photographs. 2016 September 02 Steidl releases the 2nd printings of both Night Walk and the Steidl edition of Invisible City. 2016 August 01 Summer Newsletter. 2016 July 01 Video talk by Curator Ingo Taubhorn at Deichtorhallen on the exhibition, "Ken Schles, Jeffrey Silverthorne, Miron Zownir." 2016 July 01 Deichtorhallen International Kunst und Photographie video interview by Alexa Oona Schulz with Ken Schles exploring his old turf on the Lower East Side. Produced for the Video Guide during the exhibition, "Ken Schles, Jeffrey Silverthorne, Miron Zownir." 2016 July 01 The Photographer's Gallery Not sure of the date, but a review of The Geometry of Innocence appears on the site. 2016 June 29 Frankfurter Allgemeine Zeitung Was wissen wir schon von der Welt? By Freddy Langer (in German). 2016 June 28 Artist Talk at Pratt Institute, Brooklyn NY, as part of the Photo Workshop New York sponsored by Spazio Labo' Centro di Fotografia (Bologna, Italy). 2016 May 20 Obst und Muse „In the end the book is the thing that lasts“ – Christian Reister in conversation with Ken Schles. 2016 May 14 Monovisions Black and White Photo Magazine Portfolio. 2016 May 06 Artist Talk (Künstlergespräch mit Ken Schles) at Deichtorhallen, Hamburg Germany. 2016 May 05 Deutschlandfunk Radikale Fotografie in Hamburg. Article with audio. 2016 May 4 -- August 7 Deichtorhallen Haus der Photographie Exhibition of nearly 100 images. See installation here. Limited edition available for purchase. 2016 Apri 30 Süddeutsche Zeitung Fotographie -- Straßen in Flammen. 2016 February 15 HiConsumption mentions Invisible City as one part of "Light Show: The 25 Best Photography Books." 2016 February 1 At The Rubin Museum of Art's Caberet Cinema, Ken Schles gave a short talk introducing Frederico Fellini's Amarcord and how it connected to the work of the photographer Steve McCurry. 2016 January 27 LPV Show LPV Show episode 3.3 with Sacha Lecca (photographer and Deputy Photo Editor of Rolling Stone) discuss with moderator Bryan Formhalls my book The Geometry of Innocence at the 55:16 mark to 1:03:46. 2016 January 27 This Isn't Happiness The Best Place To Be Is Somewhare Else. 2016 January 26 Feature Shoot 17 Photographers Reveal The Hardest Life Lessons When Starting Out. 2015 December 30 NRC Handelsblad The Dutch national paper NRC Handelsblad featured my exhibition at Noorderlicht Photography Gallery in their end of year list of best exhibitions shown in The Netherlands during the past year. Very pleased to share the page with Vincent Willem van Gogh and Heironymous Bosch (or is it Pieter Breugel the Elder?). 2015 December 30 NRC.NEXT The Dutch national paper NRC Handelsblad issuses a shortened daily supplement distributed freely to commuters and the culturally savvy. See above entry. 2015 December 29 VTM Online "The Best Photography Books of 2015." Invisible City selected best photography book of 2015 by VTM Online (in Vietnamese). 2015 December 29 The Photobook reviews Invisible City. 2015 December 21 The Daily Beast "The Best Photography Books of 2015." Invisible City selected best photography book of 2015 by The Daily Beast. 2015 December 16 Museum of the American Gangster Free public talk at the legendary St. Marks Theatre 80. 2015 November 26 Lozenup One Year for USA. Publication of a calendar to benefit Big Brothers/Sisters of Mississippi. One of 55 images by the same number of photographers. 2015 November 6 Vision.xitek "Ken Schles: New York East Village," portfolio from China. 2015 November 6 Illustrated Monthly Blog Online portfolio, a site for inspiration. 2015 November 5 The Deutsche Börse Photography Prize announces the short-listed artists for their 2016 award. While my work was not among the four photographers, my exhibition at Noorderlicht earlier in the year was nominated on the long list. 2015 November 05 New York I Love You, But... Group show curated by Keith Miller at NYU's Gallatin Galleries. 2015 November 2 China Club Online portfolio, from China. 2015 November 1 CNU Online portfolio, from China. 2015 October 31 New York Times "My City Was Gone (Or Was It?) and Vintage East Village," essay by Ada Calhoun/Portfolio by Ken Schles. 2015 October 23 Photo Plus International Conference and Expo "Street Photography: The Common and the Phenomenal," In the keynote panel discussion with Sally Davies, Daniel Weiss, Dennis Keeley and Jeffrey Henson Scales at the Javits Center. 2015 October 23 Steidl x Strand "KEN SCHLES + ANDREW SAVULICH W/ HANK O'NEAL" Join music producer, author and photographer Hank O’Neal in conversation with Ken Schles and Andrew Savulich, two NYC photographers, as they discuss the changing streets and sights of the city. 2015 October 5 Brooklyn Rail "Vision Anew," Review by Taylor Dafoe. 2015 September 25-30 Just Another Photo festival , New Delhi, India. 2015 September 17 Der Standard "Invisible City": Veränderte Staaten (“Invisible City”: Altered States). 2015 September 17 ART News "10 Things to Do and See at the New York Art Book Fair," Cait Munro (see #2). 2015 September 17-20 NYABF Signed copies of Invisible City and Night Walk availabe at the DAP store, PS1 MoMA. 2015 September 17 Landscape Stories Page turn Video of Invisible City (Steidl edition). 2015 August 23 - October 11 Noorderlicht Festival: Pulse: On Daido Exhibition of contemporary photographers in homage to Daido Moriyama. 2015 August 15 Zeit Magazin "Vom Hunger auf ein Leben ohne Morgen" (With a hunger for a life without tomorrow). 2015 July 18 Lit Riot Press "We view his work full of movement, with animated and spirited subjects, themes of eroticism and chaos, and a surly visceral viewing experience." 2015 July 15 Street Hunters "Invisible City is like a dark and dirty little secret." 2015 July 07 The Phoblographer "Five Photobooks That Are Sure To Inspire You." But I count six: Exiles by Josef Koudelka, The Americans by Robert Frank, American Photographs by Walker Evans, Invisible City and Night Walk by Ken Schles and Good Dog by Yusuf Sevinçli. 2015 July 02 C MPL T UNKN WN "We are riveted by American photographer Ken Schles’ startling black-and-white images. Both bleak and ravishing, lyrical and beautiful, the photographs of a now -mythic era of New York history capture the dystopian overtones of an almost Kafkaesque city, in his landmark cult book Invisible City." 2015 June 10 Issue 20 of Landscape Stories, Night, is a compendium of work from 36 photographers along with words from the likes of Jorge Luis Borges, Maurice Blanchot, Emily Dickinson and Blind Willie Nelson. 2015 June 06 Night of Art and Science (De Nacht van Kunst & Wetenschap) in Groningen, The Netherlands. Projection of Invisible City and Night Walk outside on exterior of building; gallery open until midnight. 2015 May 28 Frankfurter Allgemeine Zeitung (FAZ) Article and portfolio "Lautlos durch die Nacht" (Silent Through the Night) by Freddie Langer (German and with translation) "Both books are of enormous force so intimate and direct, that it sometimes pains the eyes. They are marked by a lust for life out of control." 2015 May 30 Dirty Harry On the Dirty Harry blog. 2015 May 25 GUP Interview (in English) "Right In Front Of Us: An Interview with Ken Schles." 2015 May 25 New Dawn Interview (in Dutch) "Recht Voor Onze Ogen: Een Interview Met Ken Schles." 2015 May 21-24 Photo London with The Howard Greenberg Gallery. 2015 May 20 Noorderlicht blog Essay: "Images Imagine Us." 2015 May 15 The Cut: New York Magazine "Preview: The Fashion World’s Most Eccentric Magazine," by Erica Schwiegershausen. 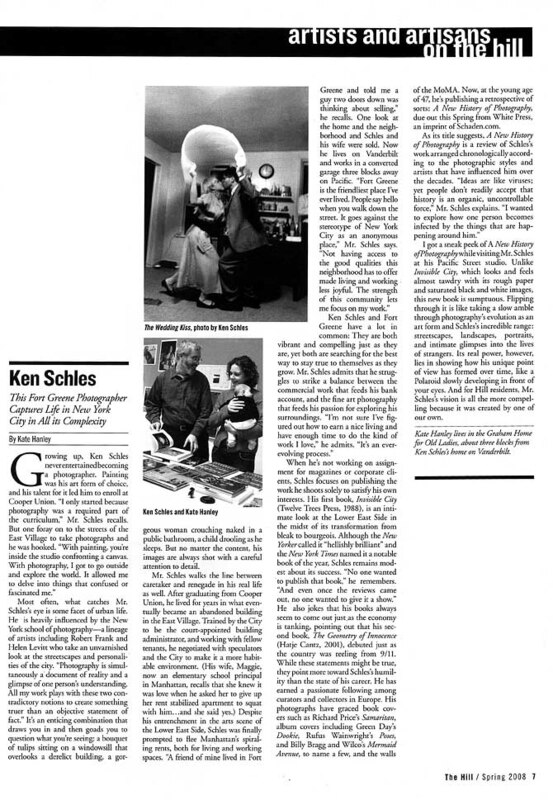 Ken Schles lead mention in the same sentence as Yoko Ono, John Waters, Harmony Korine and Mary Ellen Mark. Silly to mention perhaps, but there, I mentioned it. 2015 May 08 A Photo Editor "This Week In Photography Books: Ken Schles." On Invisible City. 2015 May 06 Lomography "Crawling Throgh The Night With Ken Schles." Night Walk. 2015 April 30th thru May 3rd Paris Photo LA Artbook D.A.P. has 50 signed copies each of Night Walk and Invisible City available at their booth, Paramount Pictures Studios. 2015 April 29 The Metropolitan Museum of Art placed a copy of Night Walk into the Thomas J. Watson Library. 2015 April 23 The Villager "Benefit Concert for 2nd Ave Fire Victims also benefitted Community." 2015 April 22 A presentation at The Coffee House on Night Walk and Invisible City at this storied private New York club. 2015 April 17 NRC "Overdonderende foto’s uit de jaren 80" (Overwhelming Photos from the 1980s) Two books by Ken Schles recently published by Steidl exhibition at Noorderlicht in Groningen. 5/5? 2015 April 16 OAI13 "Réédition d’un best-seller : Invisible city, Ken Schles" ("New edition of a bestseller: Invisible city, Ken Schles) By Camille Pandey (France). 2015 April 16 NRC "Briljant tijdsbeeld van een stad in verval" (Brilliant Portrait of a City in Decline) by Rianne van Dijck Review of exhibition at Noorderlicht in Groningen. 5/5? from the national Dutch daily newspaper. 2015 April 16 The Berkshire Eagle "Leonard Quart: Past and present in East Village." 2015 April 14 Whatever 68 Radio Nikki Palimino interviews Ken Schles on Invisible City, Night Walk and Oculus. Hour long live web interview. No link. 2015 April 12 Write up of Celebrity Benefit For East Village Fire Victims on My Fox NY.com Headlined by Patti Smith and emcee'd by Randy Jones of The Village People. Projected video of Invisible City with music by Live Skull. 2015 April 12 Celebrity Benefit For East Village Fire Victims Headlined by Patti Smith and emcee'd by Randy Jones of The Village People. Projecting video of Invisible City with music by Live Skull. 2015 April 06 BWGallerist "Preview: Invisible City/Night Walk 1983-1989, Ken Schles Noorderlicht Photogallery, Groningen, The Netherlands." 2015 April 04 Kunst Krant "Take A Walk On The Wild Side: Exhibition around two classic photo books by Ken Schles at the Noorderlicht Photo Gallery" by Gerrit Brand. 2015 April 04 Radio 1 (The Netherlands) "De ruige beelden van Ken Schles." Machiel Botman talks about the work of Ken Schles in this Dutch interview. 2015 April 03 Undo (Italy) posted an announcement for the opening at Noorderlicht Gallery. 2015 April 03 Photojournalism Now "Invisible City Revisited" in interview with Alison Stieven-Taylor. 2015 April 03 Photojournalism Now "Friday Round Up - 3 April, 2015" by Alison Stieven-Taylor. 2015 April 03 Noorderlicht "Ken Schles Invisible City/Night Walk 1983-1989" opens in Groningen, NL and runs through June 7th, 2015. 2015 April 02 Brooklyn Rail "Invisible City and Night Walk by Ken Schles." By Adam Bell. 2015 March 31 1000 Words Magazine "Ken Schles Invisible City/Night Walk." Peggy Sue Amison speaks to Ken Schles about his Invisible City and Night Walk work, which pay homage to the exploding 1980s New York arts scene and a community entwined with drugs, violence and the arrival of AIDS. 2015 March 23 Conscientious Photo Magazine "Photobook Review Ken Schles: Invisible City/Night Walk." 2015 March 18 F-Stop Magzine posted an announcement for the exhibition at Noorderlicht Gallery coming up. 2015 March 17 DE FOTOgraaf "De meester van het beslissende moment" (The master of the decisive moment) in Dutch. 2015 March 10 Photo-Eye Book of the Week Selection by David Carol (Invisible City). 2015 March 10 Artbook.com Featured photo of the day from Artbook.com from Night Walk. 2015 March 07 Flak Photo Digest #2 touts Invisible City, "Read this book! I finally got my hands on a copy and it's incredible..."
2015 March 06 Friends of Photography links to Fotomen site. In Chinese. 2015 March 06 Pro Photo Daily On books and Exhibition. 2015 March 06 Flaming Pablum writes that, "Sometimes Schles Is More." 2015 March 06 The art historian and curator Klaus Honnef wrote, "...we saw exciting photographic exhibitions, nothing new, but revealing. Howard Greenberg in midtown showed Ken Schles' cycle, "Invisible City / Night Walk 1983-1989." An absorbing and moving journey through the alternative world of downtown Manhattan in the eighties, which was recruited from artists, outsiders, fire heads, shipwrecked, Freaks and in the extensive drug use raised no question. AIDS has largely eradicated this world. At the periphery, we have come to know it - it was not our world. In contrast black-and-white images Schles the dark and desperate side of this "scene" will be displayed. Images that cause thoughtfulness, especially since creativity is celebrated as bright phenomenon." 2015 March 06 Fotomen "Foto In Your Life." Nice site from China. 2015 March 05 Arte Magazine From Italy. 2015 March 04 Astound Me Featured Night Walk and Invisible City On 2015 March 05 they featured the Night Walk Video Trailer. 2015 March 04 Ecuatoriano En Vivo From Ecuador. 2015 March 04 Internazionale Portfolio: La Citta Invisibile. 2015 March 04 Harper's Books Signing Invisible City and Night Walk at The Carlyle Hotel, 6-8pm. 2015 March 04 Anonymous Brunette composed a song to one of my photographs. 2015 March 03 The New Yorker Vince Aletti weighs in on the exhibition "Ken Schles Invisible City/Night Walk: 1983-1989" currently up at The Howard Greenberg Gallery. 2015 March 03 Dangerous Minds "Brutal, Intimate Photos Depict The 1980S ‘Heroin Epidemic’ of The East Village." 2015 March 03 Feature Shoot "Raw Photographs Capture The East Village During The Heroin Epidemic of the 1980S." 2015 March 02 T Magazine of the NY Times Discussion about the upcoming pop-up rare book store by Harper's Books at The Carlyle Hotel during the Armory Art Fair, NYC. 2015 March 02 Otra Forma de Mirar "La belleza es la percepción de algo en su contexto adecuado." (Beauty is the perception of something in its suitable context) My entry in The Photographer's Playbook: "Invent The World For Me." In Spanish. 2015 March 01 Slate "This New York City Neighborhood Was 'Invisible' in the ’80s." 2015 February 24 Collector Daily "Ken Schles, Invisible City/Night Walk, 1983-1989 @Howard Greenberg." ★★☆ "quintessential New York pictures ...crackle with youthful electricity." 2015 February 19 Tilted-Arc Backstory: Ken Schles "…we only see what we want to see. Some say we only see what we already know. But I think more is possible, that we can be opened to deeper meanings, because all understanding comes through metaphor." 2015 February 17 Curbed "Chronicling the Dark, Seedy Underbelly of 1980s New York." 2015 February 17 Artsy Featured exhibition. 2015 February 16 APA|NY Image Maker Apple Lecture with Ken Schles 7pm SoHo Apple Store, public event. 2015 February 13 Gallery Gurls "Ruven Afanador, Steven Meisel and Ken Schles: Three must-see photography exhibits." "Schles effectively documents the crime-ridden, treacherous streets of downtown New York... this show serves as a love letter to an era now eradicated by gentrification and massive corporatization of this city." 2015 February 09 Jocks & Nerds (England) "Night Walk/Invisible City 1983-1989" Interview highlighting my time in the East Village and current exhibition at Howard Greenberg Gallery. 2015 February 09 Musee Magazine Ken Schles Invisible City/Night Walk at Howard Greenberg. 2015 February 09 L'Oeil de la Photographie "February : MEP Bookstore selection by Irène Attinger," Irène Attinger’s selection of photography books on sale in the bookstore of the Maison Européenne de la Photographie in Paris. They were chosen for their originality, editorial quality and the importance of their content. Invisible City et Night Walk. 2015 February 06 FUBIZ "Black and White Historic Photography" has me between Henri Cartier-Bresson and Louis Faurer next to a photo of Jack Kerouac. Only, I'm not dead yet. 2015 February 05 La Maison de la Européene Photographie "Le choix de la librairie # 16," Une sélection, par Irène Attinger, d’ouvrages en vente à la librairie de la MEP, qui, en raison de leur originalité, de leur qualité éditoriale et/ou de l’importance de leur contenu, participent de l’image de l’édition photographique internationale. Invisible City et Night Walk. 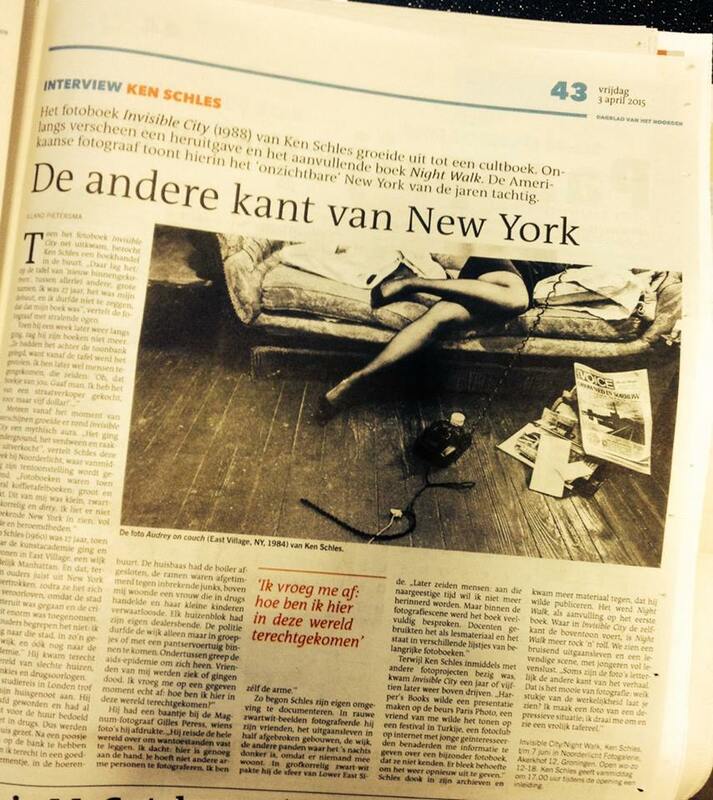 2015 February 04 Knack Focus (Belgium) "Shooting Gallery New York" Interview and article in Dutch by Stefan Vanthuyne for the Belgium magazine on Invisible City and Night Walk. 2015 February 04 This Greedy Pig "Ken Schles' New York City." 2015 February 03 Photo-Eye Blog "Book of the Week: A Pick by Ken Schles" Ken Schles reviews Unnamed Road by Jungjin Lee, published by MACK. 2015 February 03 Huck Magazine "A gritty and penetrating portrayal of New York’s Lower East Side in the 1980s Ken Schles' Night Walk Underground cult classic body of photography Invisible City, by LES documentarian Ken Schles, reissued for the Twenty-First Century." 2015 February 03 Bedford + Bowery "From the Streets to the Suites 80s East Village Shows In Modern Day Midtown," Ken Schles' opening at Howard Greenberg. 2015 February 02 Aesthetic Magazine Blog Ken Schles at Howard Greenberg. 2015 January 31 New York Observer In the Real Estate section, The NY Observer references the bad old days and sends readers over to the WSJ article about my photographs of 1980s East Village. 2015 January 31 Sprit And Flesh promotional video. 2015 January 31 Best photobooks of January 2015 according to Josef Chladek's server stats. 2015 January 30 Emaho Magazine "Ken Schles' Invisible City Portrait of 1980s Downtown New York." 2015 January 29 The Howard Greenberg Gallery “Invisible City/Night Walk (1983-1989)" opens at the Howard Greenberg Gallery to the largest opening in their history. 2015 January 29 Bedford + Bowery “Ken Schles Photographed The Last Pre Internet Bohemia The East Village in the 80s." The blog of New York Magazine. 2015 January 29 American Suburb X (ASX) “INTERVIEW: Ken Schles on ‘Invisible City’, ‘Night Walk’ and Existential Impulses," an interview between myself and Alex Bocchetto of Akina Books, London. 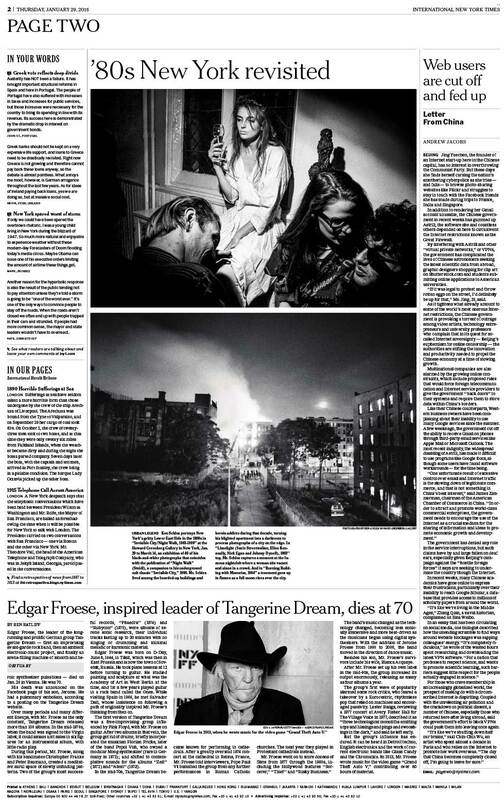 2015 January 29 The Wall Street Journal “In Ken Schles's Photographs, A Grittier East Village Comes Back Into Focus." 2015 January 29 International Edition of the New York Times Page Two: "80s New York Revisited." 2015 January 29 Sprit And Flesh "Ghosts of New York" web portfolio marking the publication of the print magazine Spirit And Flesh. 2015 January 28 Fluorodigital "Ken Schles Invisible City/Night Walk 1983-1989" slide show. 2015 January 28 Yahoo! News "Ken Schles documents Life NYCs Lower East Side In The 1980s" slide show. 2015 January 25 New York Magazine The Approval Matrix Brilliant / Highbrow on the exhibition at Howard Greenberg Gallery. 2015 January 22 Eddy Vallante Tumbler site with "behinds the scenes" photos made while taping the LPV show. 2015 January 22 Episode 2.6 of the LPV Show Soundcloud interview and lots of fun. 2015 January 22 The Los Angeles Review of Books “Life exists as pathology in New York." Michael Kurcfeld of the Los Angeles Review of Books examines Ken Schles' work. Review and 7 minute video. 2015 January 09 The Story of Photography A blog on photographers. And this entry has my story. In Greek. 2015 January 08 Interview Magazine selects Invisible City the best photobook of January 2015! 2015 January 08 World News "All Around The New York photo-marauder Ken Schles publishes two volumes on “metropolitan hell” " This one had to be written by an algorithm! 2015 January 08 20 Minutos (Spain) also references the NYTimes profile but runs the headline NY Photo-flaneur Publishes Two Volumes on His Metropolitan Hell. 2015 January 03 Dia Standard (Japan) selects Invisible City in its top 10 favorite photobooks of 2014. 2015 January 03 Les Particules Estranges on Invisible City. 2014 December 31 Cuatros Cuerpos calls the reprint of Invisible City a "masterpiece" in its round-up of favorite photobooks of 2014. 2014 December 30 ARTNews links to the NYTimes profile and portfolio in its news Around The Art World. 2014 December 30 Untapped Cities Blog picks up the NYTimes profile and portfolio. 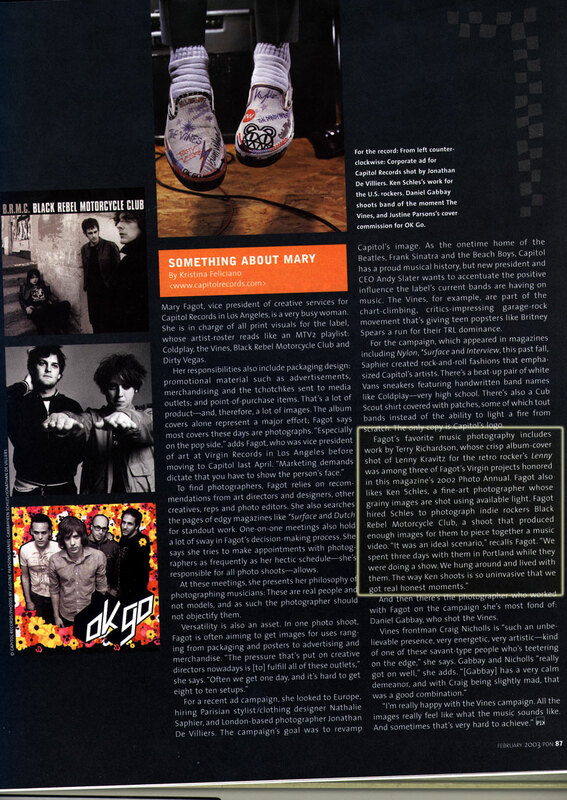 2014 December 28 Flaming Pablum questions my use of Sonic Youth's "100%" in my Night Walk book trailer. 2014 December 28 E.V.Grieve picks up the NYTimes profile and portfolio, along with links to videos as well as other connections. 2014 December 28 Miwa Susuda selects the reprint of Invisible City among best photobooks of 2014. 2014 December 26 The New York Times runs an online portfolio from Invisible City and Night Walk in addition to a small interview. Print version was published in the Metropolitan section on December 28th, 2014 page 10. 2014 December 24 Mother Jones selects the Steidl editions of Invisible City and Night Walk as Best Photobooks of 2014. 2014 December 19 Vogue Italia selects the Steidl editons of Invisible City and Night Walk as Best Photobooks of 2014. 2014 December 16 Dashwood Books hosts the 1st Stateside signing of Invisible City and Night Walk. A record turnout, by their accounting, with a line out the door. Sold out. 2014 December 14 Kominek Tumblr the reprint of Invisible City and first edition of Night Walk. 2014 December 11 Photo-Eye selects Night Walk among best photobooks of 2014. 2014 December 07 Stumbled across Achtung Photography's bit on Invisible City. "This book is one of the highlights published in the 1980s." 2014 December 02 Mass Appeal Eye Popping NYC Books Invisible City and Night Walk. 2014 November 28 TIME selects the Steidl editions of Invisible City and Night Walk as Best Photobooks of 2014. This is the first time an artist has had two books honored in the same year thusly. 2014 November 12-16 Paris Photo in the Grand Palais, Paris. Exhibition at the Howard Greenberg Gallery. Book signing and release of the reprint of Invisible City and the debut of the publication Night Walk, both with Steidl. 2014 October 27 This Isn't Happiness "Night Walk" with images from Invisible City and Night Walk. 2014 October 18 - November 17 Fotoistanbul Cities and Stories brings together the work of reknown photographers William Klein, Guy Tillim, Tom Roma, Chris Anderson, Ken Schles and Seiji Kurata among others in this festival on the banks of the Bosphorus. Master talk by Ken Schles on Night Walk also brings to Istanbul the world premiere exhibition of this body of work. 2014 October 16 Festival Foto Istanbul Cities and Stories overview by Laurence Cornet in L'Oeil de la Photographie. 2014 July 02 A Suspension of Memory This new Daylight Digital project presents images from Invisible City and premieres images from the soon-to-be-released Night Walk — synthesized together with video and an original collaborative text by Alan Rapp. 2014 June 19 L'Oeil del a Photographie Vision is only perception when it is stimulated by experience, which is impregnable. Review of Oculus at Only Photography, Berlin, by Laurence Cornet. 2014 June 02 Invisible City book trailer with music by Live Skull. 2014 June 02 Rangefinder magazine looks at my stuff. 2014 May 28-30 Steidlville onsite production of reprint of Invisible City and the 1st edition of Night Walk. 2014 May 17-18 PGH Photo Fair, Carnegie Museum of Art. Booksigning, informal talk and an exhibition of prints from Oculus. 2014 May 12 Art For Tibet 5 benefit. 2014 March 22 Martin Parr and Gerry Badger give a presentation on The Photobook: A History Volume III at Le Bal in Paris. 2014 March 04 Publish Your Photography Book , (2nd ed. revised and updated) Princeton Architectural Press, 2014. Darius D. Himes and Mary Virginia Swanson survey the current landscape of photography book publishing. Includes my essay on publishing my eBook study on Ken Schles: Invisible City, A Digital Resource. 2014 February 6 Exhibition of special edition photography book titles including Schles' Oculus alongside others opens, Only Photography, Berlin, Germany. 2014 January Publication of Dan Winter's On the Road To Seeing, in which my photograph, James About To Marry, is reproduced in a chapter chronicling 175 years of street photography. 2014 January 9 Douglas Stockdale on The Photobook blog describes 10x10 American Photobooks. 2014 January 04 Johan Brink makes a selection of best photobooks of 2013 and includes 10x10 American Photobooks in his blog (Johan Brink) 2013 års bästa fotografi. 2013 December 16 Douglas Stockdale on The Photobook blog self-referentially lists 10x10 American Photobooks as an interesting photobook of 2013. 2013 December 12 Bint Photoboks on INTernet - Bintphotobooks Selection of Notable photoBooks 2013 lists 10x10 American Photobooks. 2013 December 10 Deirdre's Best [Photobooks] of 2012-2013 Monsters and Madonnas, the blog of the library at the International Center of Photography lists 10x10 American Photobooks. 2013 December Rangefinder Magazine, Photo Finish "New York City Night Life" by David Carol on the reprinting of Invisible City. 2013 November 10 American Photo Magazine "Photobook Collectng In he Age of the Thousand Dollar Zine," an interview with photobook expert Tom Claxton gives advice on photobook collecting and mentions his strategy for obtaining a copy of Invisible City. 2013 November 9 The New Frame writes about Invisible City. 2013 November Belgrade, Serbia first Visualizer Festival exhibition of Invisible City. 2013 October 24-27 6th Kassel Fotobook Festival releases the volume On Daido, a photographic anthology of statements and homages to Daido Moriyama made by internationally known photographers and authors (I was honored to be be invited to contribute). 88 pages, 30×30 cm. Out of print. 2013 September 24 Review of the 10x10 American Photobooks project. For the FOAM Blog. 2013 September 16-24 The first Sofia Photography Festival in Sofia, Bulgaria featuring an exhibition of Invisible City. Here is a link to the catalog. 2013 September 15 Announced selections for the 2013 Kassel Photobook Award, of which I was a jury member. 2013 September 11 10x10 American Photobooks opens at the Tokyo Institute of Photography. Invisible City will be on display in the gallery and reproduced twice in the book, selected by both Kazuhiro Yamaji of Flying Books and Douglas Stockdale of the Photobooks blog along with A New History of Photography selected by Tom Claxton of Claxton Projects. I also contributed an essay to the catalog. 2013 September 10 The selection of Invisible City for the 10x10 American Photobooks exhibition by Kazuhiro Yamaji of Flying Books of Tokyo is revealed. 2013 September 08 To end AD Coleman's five part blog series on the state of contemporary photobook publishing, There Will Be Ink, Coleman weighs in on e-book publishing and ends his essay with a link to the e-book/iBook study of Invisible City by The Photobook Club. 2013 September 08 The launch of the new magazine Let's Panic features an essay by Ken Schles and reproductions from Invisible City. 2013 May 30 A chance encounter led to this [Canadian] blog entry. 2013 May 06 This, an interview with the noted photographer Ken Light is well worth listening to, plus he gives the work of Ken Schles a nice shout out towards the end of the piece. Spring 2013 The Turkish originated Dog Food issue two edited by Jason Eskenazi, Laurence Cornet, Laura De Marco, Arjen Zwart and Fred Lezmi. Here, I soliloquize my photobook collection and list my favorite ten books and films. 2013 May 03 10x10 American Photobooks previews in LIC, NY ahead of an exhibition September 2013 at the Tokyo Institute of Photography. In addition to the selections mentioned below made by photobook experts, I was asked to contribute an essay to the catalog. 2013 April 30 Podcast interview on Necessary and Sufficient. Prime and Zoom: Funny how an effort to define a technical photographic idea quickly shifts into the realm of meaning. 2013 April 27 2013 "These photobooks all have one critical characteristic in common: insightful and intelligent artists have produced them. They are photographers who use the tools of their medium to enquire, reflect and provoke, and have produced works that compel the viewer to question both the subject documented and the social landscape of our surroundings." Tom Claxton on his Claxton Projects site announces 10 selections for the publication 10x10 American Photobooks (see description in previous entry). Tom Claxton cites the 10 significant books of the last 10 years, A New History of Photography being one of them. 2013 April 25 2013 "Ken Schles – Invisible City: Photographs by Ken Schles (Twelvetrees Press, 1988) A gritty documentary project that brought the essence of Robert Frank into the city. A photobook that is a classic and a wonderful example of the progression in photobook publishing." Douglas Stockdale on his Photobooks site announces his selection for the publication 10x10 American Photobooks, a new publication to be released this Fall listing significant contributions of American photobook makers in the last 25 years. This project, spearheaded by the International Center of Photography Library, the Tokyo Institute of Photography and the Facebook Photo Group selected photobook experts from around the world to make selections. 2013 March 08 Talk on 4 books, an eBook and an upcoming publication at the University of California Berkeley Graduate School of Journalism Center for Photography accompanying exhibition. 2013 March 7 "Don't Miss" San Francisco Chronicle runs half page description of exhibition of Invisible City at the University of California Berkeley Graduate School of Journalism Gallery Center for Photography in the 96 Hours section of the paper. Reception, talk and book signing March 8th. 2013 March 04 Aphorisms towards imagery. Take a talk and remove all referencecs to specific images, and we are left with a theory of photography. For the FOAM Blog. 2013 March 04 Ken Schles – Invisible City: A Digital Resource mentioned in "Digital Photobook Advantages." 2013 February 13 Le Journal de la Photographie Essay on the Invisible City exhibition in Berkeley. "We know a place best through the intimacies of contact: through direct and meaningful encounters with people situated in the everyday; through the tactile surfaces of walls and flesh and streets—and through the mythos that we distill from each and every one of those encounters..."
2013 February 11 Gave a talk at Cooper Union (my alma mater) for a history of photography class. The talk was on my book: A New History of Photography. But what was really special about it was seeing Gail Buckland, the extraordinary history of photography professor I studied under still teaching --33 years later. 2013 February 5 The Antifoto Manifesto With texts and statements by Manuela Barczewski , Michael Biedowicz , Laura Bielau, Janine Blöß, Sophie Boursat, Ulrike Brückner, Swen Buckner, Ben Burbridge, Olivier Cablat, Charlotte Cotton, Joerg M. Colberg, Christoph Dettmeier, Felix Dobbert, Jason Evans, Martin Fengel, Rainer Gabriel , Stefanie Grebe, Allison Grant, Stephen Gill, Stefanie Haarkamp, Sebastian Hau, Robert Hartmann, Marvin Heiferman, Yoshinori Henguchi, Elmar Hermann, Christoph Hochhäusler, Todd Hido, Iris Maria vom Hof, Anton Ignaz, Mischa Kuball, Thomas W. Kuhn, Karin Krijgsman, Doris Krystof, Christiane Kuhlmann, Jeffrey Ladd, Jason Lazarus, Peter Lindhorst, Thomas Neumann, Gordon MacDonald, Ted Partin, Ulrich Pohlmann, Doug Rickard, Judith Samen, Adrian Sauer, Ken Schles, Joachim Schmid, Sigrid Schneider, Wilhelm Schürmann, Thomas Seelig, Oliver Sieber, Alec Soth, Juergen Staack , Eric Stephanian, Clare Strand, Katja Stuke, Mariko Takeuchi, Anke Volkmer, Thomas Wiegand, Denise Winter, Erik van der Weijde, Duncan Wooldridge, Anna Zika, Damian Zimmermann. 2013 January 22 Quoted on My Eye Is My Window site. 2013 January 03 Essay Images and Emergence. Ken Schles considers how image-making, like other forms of technology, has implications far beyond its primary purpose. For the FOAM Blog. 2012 December 12 The Book of Books from the website (China) Hydrogen Peroxide (h2o2). 2012 December 10 Oculus The Photobook Club's B*@t of year two years back to back. "It is always pleasing to find out that the book you were gushing about 12 months ago is one that has continued to entertain and educate/frustrate over this past year." 2012 December 08 Invisible City by Ken Schles from 1988. (3:10 mark) "Perhaps one of the greatest portrayals of nocturnal urban life of the 20th Century -- certainly keeping equal company with Brassai's classic Paris de Nuit. Writing in 1988 New York Times Critic Andy Grundberg hailed its "minor key vitality and unkempt brilliance." Critic Guy Trebay said Schles' Invisible City is "a picture book that comprehends both the shambles and the thrall of the city," " quotes Photo-Eye auction's curator, Eric Miles. 2012 November 27 Top Digital Photobook (2012) Ken Schles: Invisible City, A Digital Resource by The Photobook Club as selected by The Digital Photobook website. A book about my book is selected as a best book of 2012. 2012 November 08 Essay Representation And Its Double. Ken Schles explains photography's infinite capacity to distort our understanding of reality as well as add to it. For the FOAM Blog. 2012 October 18-22 Texas Contemporary Art Fair. Rick Wester Fine Art shows Arbus, Avedon, Brandt, Frank and Schles, among others. 2012 October 18 A pop-up book exhibition at the Irvine Arts Center in Irvine California will replicates the book exhibition curated for the FotoGrafia di Roma XI exhibition at MACRO (Oculus included). 2012 October 07 Essay The Scale of Reality. We live in a physical world and we live in an image world. Ken Schles looks at the relationship between our relative size, the tools we make and the ideas we have to explain how we see and experience the world. For the FOAM Blog. 2012 September 22 Talk on Invisible City at the Istanbul Photography Museum. Exhibition extended to October 15th. 2012 September 20 As part of the FotoGrafia di Roma XI, there will be an exhibition of important recent photographic books on exhibit at the Museo d'Arte Contemporanea di Roma (MACRO) Testaccio, guest curated by Douglas Stockdale of The Photobook blog. My book Oculus will be on display and a copy placed into the permanent collection of the museum. 2012 September 19 Oculus among Le Journal de la Photographie's round-up of best photobooks of the season. "a unique book that will speak to Every Man at every level ...beautifully crafted ...deeply satisfying. This fourth book marks Ken Schles as a true master of his art and culture maker of the highest caliber." 2012 September 03 Essay We Make Lists Because We Don't Want To Die. Umberto Eco says we make lists because we don't want to die, because it is what we do to bring order and comprehension to a world that touches on the infinite. For the FOAM Blog. 2012 September 03 Matt Johnston Five questions to Matt Johnston of The Photobook Club An interview with Matt Johnston, founder of the Photobook Club and publisher of Ken Schles: Invisible City, A Digital Resource on the blog The Digital Photobook. 2012 August 27 Orientation lecture to incoming master candidates, School of Visual Arts, NYC. 2012 August 02 Essay In Splendid Isolation. Ken Schles explains how not just images, but our very selves are unavoidably the product of what surrounds and informs us. For the FOAM Blog. 2012 July 19-22 ArtMRKT Hamptons booth 209. Rick Wester Fine Art shows Schles, Frank and Arbus. 2012 July 02 Essay The Look of Love. Ken Schles recounts the death of both his parents just hours apart and is reminded of the shifting nature of meaning in photographs. For the FOAM Blog. 2012 June 23 - Oct 15 Istanbul Photo Museum (Istanbul Fotograf Müzesi), Three Photographers: from Bursa to Istanbul, Istanbul, Turkey. 2012 June 14 Matt Johnston interviewed at the SIP Blog: Recent Genealogy of the Photobook: on Ken Schles' Invisible City, A Digital Resource. 2012 June 02 Essay A Call From The Wilderness. Ken Schles acknowledges the important role programmes like Noorderlicht play in supporting the development of an artist's practice. For the FOAM Blog. 2012 May 11 Matt Johnston Ken Schles' Invisible City, A Digital Resource (runtime 04:30). 2012 May 02 Essay Staving Off Infinite Regress By Way Of Interpreting Agee. In his first post for the Foam Blog, Ken Schles takes James Agee as a starting point to explain the relationship between seeing and knowing. For the FOAM Blog. 2012 May Interview with Christian Patterson on his book Readheaded Peckerwood, "Photographer, Detective, Photobook-Maker," The Photobook Review (PBR002), Aperture Spring 2012. 2012 April 21 The Photobook Club of New York let me talk about my books. 2012 April 16 The Photobook reviews Oculus "A refreshing change...highly recommended". 2012 April 16 Cuatro Cuerpos "Somos lo que vemos, vemos lo que somos" (We are what we see, we see what we are) Review in this wonderful Spanish photobook blog out of Madrid of A New History of Photography. Translation. 2012 January 25 and 30 I got a chance to guest blog for the esteemed photocritic A.D. Coleman on his blog Photocritic International. What do an evolutionary biologist and a Situational theorist have to teach us about the contemporary state of photographic criticism? Read my essay "Infinite Stupidity." Part one is here and this is part two. January 16 2012 Librarie Chloe & Denis Ozanne issue the catalog "New York," which also includes a reference to Invisible City. 2012 January 12 Marc Feustel's Eyecurious Blog entry "On introspection, navel-gazing and nitpicking" references my musings on Umberto Eco's Lists. 2012 January 11 This on the Photobookclub site (UK): "A few months ago Ken Schles spoke at the SPE Northeast Conference in Syracuse [link to talk embedded at their site or see November 5th, 2011 entry below], if ever there was a dream-team conference, this was it for me! Ken's talk was posted online yesterday and I recommend anyone with even a passing interest in photobooks must take the time to view it. Ken takes us through all four of his monographs, looking both at content and theme as well as the publication challenges and triumphs he experienced. What most interested me is just how much Ken's books seem ultimately to form chapters in a much larger body of work, his interests and more importantly questions are never repeated, but we are reminded of them constantly. Ken is proof that Tod Papageorge knew what he was talking about: "If your pictures aren't good enough, you aren't reading enough" – Tod Papageorge This talk is best enjoyed with a chilled beverage and note taking device"
2011 December 27 Photo-Eye Best photobooks of 2011. Oculus "A poignant meditation on images and memory, Schles' book is as evocative as it is beautiful." 2011 December 22 Photo-Eye Review of Oculus by Adam Bell "Oculus is an unusual and uniquely important book, and defies easy categorization. Equal parts philosophical treatise and artist book, Oculus asks profound questions about how we find meaning in the world and how images give shape to memory and our lives. Viewers willing to spend time with this powerful work will be greatly rewarded." 2011 December 16 Conveyor Blog Photobook Friday report on my sold out book signing at the International Center of Photography the night before "Oculous, [sic] released this October by Stichting Aurora Borealis, is an absolutely drop dead gorgeous, twelve inch by nine inch, ninety-six page book-fetishist's delight..."
2011 December 15 ICP Bookstore Oculus booksigning. Sold Out. 2011 December 1 New York Foundation for the Arts Currents Meet A NYFA Artist Interview with 1989 Fellow Ken Schles ahead of a booksigning for Oculus at the International Center of Photography. Ken Schles looks at his career and focuses on his new book Oculus. "Our images are projections that are representative of our awareness of the world." 2011 November 27 ICP Library Blog round-up of books from Paris Photo. Includes Oculus and a photograph of me at Paris Photo Offprint signing copies of my newly released book. 2011 November 9 thru 13 Paris Photo Book signing for Oculus at the Schaden.com booth, Paris Photo and Offprint. Sold Out. Showing of Invisible City: Nightwalk, Outtakes and Fragments at Harper's Books. 2011 November 5 Light Work hosts SPE Joint Regional Conference on "Photographers + Publishing": A talk by Ken Schles 4 Books (runtime 57:57). 2011 October 21 thru December 1 Oculus Groningen, The Netherlands at Noorderlicht. October 21st opening of the exhibition featuring an interview of Ken Schles by Ed Kashi. Release of the book Oculus. Look here to see exhibition installation. 2011 October 15 thru 19 The 1st Annual Bursa Photo Festival Bursa, Turkey. Exhibition of Invisible City. Master Photographer Guest Speaker. Member of panel disscusing book making, reader along with others present for Jason Eskanazi's Robert Frank "The Americans" and panel discussion on publishishing. Judge for the book dummy award. Portfolio reviewer. Book signing. 2011 October 14 Guide to Useful Photography (GUP), NL RECOMMENDED. Write-up of Oculus: "Schles invokes Nabokov's idea that memories are the brief separation between the soul's abyss before life, and after death. If these images are a collection of Schles's memories, he's shared them with us, not because we can ever touch his memories, or see them fully, or even understand them; but because we are human, and we can project our own meanings, our own memories." 2011 October 1 thru 3 Platform LA West Coast preview of the limited edition of Oculus at Lapis Press booth. 2011 September (all month) The Photo Book Club (UK) crowd sources and hosts a month long discusssion of Invisible City. Click through for commentary. 2011 September 30 thru October 2 New York Art Book Fair at PS1 Debut of Oculus with advance copies at the Dashwood booth and preview of the limited edition at Charles Lane Press booth. 2011 March 13 Double Lecture Ken Schles and Jeffrey Silverthorne at the Noorderlicht Photogallery, Groningen, The Netherlands On Sunday, 13 March, Noorderlicht is the right place to be for an inspiring afternoon about photography. Our guests will be two photographers who for many years now have been far from strangers to any audience of photography lovers: Ken Schles and Jeffrey Silverthorne. In the course of their careers both have developed a strong and highly individual style. That is reason for Noorderlicht to devote attention to these two grand masters with a book and exhibition later in 2011. Before that happens, you can already enjoy a foretaste of the experience on 13 March. Ken Schles will present a lecture on his view of the history of photography, and how it has influenced our way of seeing. In 2008 his book A New History of Photography appeared, inwhich he seeks to interpret the history as "a living document that breathes and whose significance changes according to whomever does the looking." For his thesis he draws from a quarter century of his own work and examines how ideas from many sources ultimately become embedded at the individual level. The book was hailed by Photo-Eye Magazine as one of the best photo books of the year and by now has achieved cult status in photography circles. 2010 December The web entity Phonar - [fo-'när] (run by Jonathan Worth out of Coventry University in the UK) put together a list of photography books by selecting a small group of practioners, critics and writers and asking them to nominate a book. Those book authors were then, in turn, asked to do the same "…we contacted some of the worlds most inspirational photographic practitioners, thinkers, authors and publishers and asked them for a book nomination that is notable/ inspiring/ seminal/ provocative, in it's narrative structure/approach or perhaps in its 'discussion' of narrative" The results yielded 31 contributors, 60 nominations on 54 different books. Invisible City was selected twice. August 2010 The University & College Designers Association (UCDA) bestows its award of Excellence for work on Brandeis University's viewbook, created by Deborah Weider, design director; Ken Schles principle photography. 2010 June into July Exhibition and symposium, Visual Studies Workshop (VSW) Photo-Bookworks Symposium, Rochester, NY. Exhibition is the same traveling exhibit The Photo-Book Works shown in the Sheehan Gallery, Whitman College, WA. Symposium is July 1-3. Exhibition is June 28-July 31. May into June 2010 Recent work for Brandeis University wins two silver awards, in two categories from the Council for Advancement and Support of Education (CASE). A sampling can be found here on this website. 2010 April 27 AmericansuburbX ran a bit about Invisible City. See it here. March 5 2010 The Photo-Book Works exhibition in the Sheehan Gallery at Whitman College opened. Eventually the show will travel to the Visual Studies Workshop in Rochester, NY in July for their Photo-Bookworks Symposium. Curated by David Schulz. March 4 2010 Invisible City and A New History of Photography: The World Outside and the Pictures in Our Heads were both acquired by the Wallach Division of Art, Prints and Photographs at The New York Public Library. Find Invisibe City in a library near you. Find A New History in a library near you. March 2010 I set up a Facebook fan page. It would please me if you join. 2010 January An informal appearance at the photo LA Schaden.com booth where I shared a working copy and prints from my new Oculus project. 2009 June A New History of Photography was a finalist for the 40th Annual Contemporary Author Book Award 2009 - LES RENCONTRES D'ARLES PHOTOGRAPHIE. A satellite showing of the book's images was projected in Arles during the festival along with other Schaden.com White Press projects in The Supermarkt space on Thursady July 9th at 9pm, Place de la Roquette, Arles, France. The two book prizes went to Susan Meiselas for In History, which documents the shattering impact of war on landscape as well as people, and to Swedish photographers Anders Pedersen and JH Engstrom for From Back Home, their collaborative study of their home country over two generations. Good as the study is, it seemed an odd choice considering the strong competition. I can't help feeling that, just as there is too much photography here, there are also too many photography books. From Sean O'Hagen, The Guardian (UK). Link to full review of the festival. 2009 September 9 From A.D. Coleman's blog Photocritic International: "I’ve known photographers who speak and write wonderfully, even brilliantly, about their own work — Mark Klett, Arno Rafael Minkkinen, and Ken Schles, to name three." 2009 May: On the French photography blog 12th Press, an essay by Nicholas Calcott on the relationship between photography and Italo Calvino's book Invisible Cities. 2009 April: On Jeff Ladd's blog 5b4, in a thread responding to Jeff's 2nd anniversary posting on the inflated value of great photobooks, there is an entry (last one) where Gerry Badger weighs in and mentions my book Invisible City. I think the whole thread is pretty interesting. Read it from the start here or click here to just read Gerry Badger's entry (Invisible City is mentioned in the 1st paragraph). 2009 April 18-19 At The Pacific Street Photographic Workshops Jeff Ladd and I taught a weekend workshop Making The Photographic Book. Response? "...both [are] incredibly passionate, well-informed teachers and your love for photography and books is very inspiring. I would recommend the class to anyone who wants to develop a deeper understanding of photography books and how to conceptualize them." — Amy S. "The sharing of ideas was generous and intelligent." — Laurie L. "Ken and Jeff were very attuned to the individual needs of the participants. ... Thanks so much for an inspiring and memorable course!" — Sebastian Z. 2009 March 11 The International Center of Photography Lecture: A New History of Photography. Runtime: 45 minutes. Link takes you off-site. 2009 February 4 and 11 Photo-Eye Magazine review: "Ken Schles: A New History of Photography" by George Slade. Response by Ken Schles. Of the exchange, Daniel Espeset, Managing Editor of Photo-Eye Magazine said,"when first designing the magazine online we were very excited about the potential for creating dialogue and interaction, rather than simply offering unidirectional interpretations of the work. This is the first time I feel like we've fully achieved that goal..."
2009 January-March : More Intensified: The Music Photography of Ken Schles, 1993-2006 a solo exhibition at The Noorderlicht Gallery in Groningen, Holland. 2008 December 31 Photo-Eye Magazine feature story: "a host of photo-world luminaries weigh in on the Best PhotoBooks of 2008" See Jeff Ladd and Markus Schaden's lists. 2008 December 30 Print Run "Best New Books | 2008" #2 A New History of Photography by Ken Schles "One of the most original and challenging books published this year." 2008 December 13 5b4 "Best Books of 2008" #4 A New History of Photography by Ken Schles (Schaden/White Press) Inventive, witty, smart and great book craftsmanship and concept. 2008 Winter 1000 Words Photography #03 winter 2008. Review of A New History of Photography by Ken Schles. 2008 Novenmber 28 FAZ "How does a photographjic style develop? By observing the themes of our time!." Article on A New History of Photography by Ken Schles. 2008 September 26 Süddeutsche Zeitung Image As Container, excerpt from A New History of Photography by Ken Schles. Excerpt was translated by Andrian Kreye for publication in Germany's largest daily paper. September 2008: Official release of A New History during Photokina, Cologne, Germany. 2008 August/September Hotshoe "Hot Books Ken Schles: A New History of Photography Insight into the mind of a great photographer," article by Bill Kouwenhoven. 2008 May 26 Süddeutsche Zeitung Cornell Capa obituary, article by Ken Schles. 2008 Spring The Hill Artists on the Hill, Kate Hanley (on the publication of A New History of Photography). 2006 March Art in America Ken Schles at Lucas Schoormans, Edward Leffingwell. 2006 March 10-13 NY Art Fairs 3/10-13/2006 At the New York Armory Show Schaden.com will show limited edition books by Ken Schles. At the Pulse Art Fair Lucas Schoormans will show photographs. 2005 November New Yorker Goings On About Town Galleries-Chelsea, Vince Aletti on Ken Schles Photographs at the Lucas Schoormans Gallery. 2005 September 4 -- October 9 My project Homeland Security debuted as part of the Noorderlicht Festival entitled Traces and Omens. Running concurrently is an exhibition of Promised Land, which will inaugurate Noorderlicht's new home and exhibition space in Groningen, The Netherlands. Click here for more details on the festival and see below for more information on Promised Land. Interview between Miriam Nooi (050 Uitmagazine Groningen) and Ken Schles, August 1st 2005 regarding his project An Absence in the Presence of Things in the Promised Land exhibit at the Noorderlicht Gallery in Groningen, The Netherlands, which ran July 30th 2005 through October 9th 2005. Promised Land, Noorderlicht, Groningen, 2005, photographs by Anders Petersen, Antoine d'Agata, Ken Schles, John Davies and Adrienne van Eekelen on the city of Groningen (NL). Previewed and order it here. An exhibition from the project ran cuncurrently with the Noorderlicht Photo Festival held in Groningen, The Netherlands (see above). Marks of Honour: A Striking Library opened 5/10/2005 at the FOAM in Amsterdam and then moved over to Gallerie van Zoetendaal. Curated by Markus Schaden and Wilem van Zoetendaal, it included the work of 45 international photographers using the book as a means of expression: Morten Andersen, Paul Andriesse, Sara Blokland, Andy Bosma, Tudor Bratu, Koos Breukel, Olivier Cablat, Serge Clement, Eli Content, Nicolas Descottes, Leo Divendal, Charlotte Dumas, Machiel Botman, Bertrand Fleuret, Albrecht Fuchs, Julian Germain, Stephen Gill, Jacqueline Hassink, Elias Hassos, Koen Hauser, Todd Hido, Cuny Janssen, Verena Kaltenbach, Dirk Kome, Paul Kooiker, Katrin Korfmann, Jan Koster, ULAY, Andreas Friedrich, Loodwick Press Images, Simone Nieweg, Arno Nollen, Martin Parr, Nina Poppe, Diana Scherer, Ken Schles, Joachim Schmid, Johannes Schwartz, Harold Strak, Katja Stuke, Oliver Sieber, Ruth van Beek, Carla van de Puttelaar, Mark van den Brink, Bertien van Manen, Jasper Wiedeman and Wolfgang Zurborn. All participating works (limited to five copies, each containing the original photobook and it´s complentary homage) offered a wide spectrum of approaches often surprising in their detail: Martin Parr chose Araki's Banquet, Koos Breukel chose Ed van der Elsken's Love On The Left Bank, Todd Hido commented on Susan Sontag's On Photography and Ken Schles made reference to Beaumont Newhall's Photography: A Short Critical History, the first english language critical history of photography. Marks Of Honour constituted a singular library and a system of reference on the most sustainable influences by the freshest visionaries in contemporary photography. Note: It was for this exhibition that I developed my project A New History of Photography: The World Outside and the Pictures In Our Heads. Refrences on the web have all but disappeared, but this landmark exhibit was reprised for a second iteration in 2009, again at the FOAM, with new curators and contributors. In 2012 the form was appropriated by Aperture for an exhibition of artists published by the Aperture Foundation. Aperture Remix was exhibited October 17–November 17, 2012. 2004 November/December Photograph Photo Books, Vice Aletti. Invisible City placed in the context of current book practice. 2004 FOAM Issue #5 NEAR, a portfolio from Invisible City. FOAM is the quarterly publication of the Photography Museum Amsterdam. (Link is to IC on this site). N.D. A description of Invisible City found on modernrare.com. N.D. A description of The Geometry of Innocence found on modernrare.com. 2003 Fall 2003 IPA Photographer of the Year Award for Culture. For awards listings click here. For bio, click here. 2003 February PDN Something About Mary, Kristina Feliciano. 2002 Winter Issue 70 Volume 22 Issue 2 European Photography Chris Miller. 1999 September Foto Portfolio Nieuw Werk van Ken Schles, Eddie Marsman. 1994 March - May Downtown, Nederlands Foto Institute. 1994 April - July Selections from the Permanent Collection, Art Institute of Chicago. 1994 February In Camera: Photography and the Interior. 1993 March Lynne Cohen, Paul Graham, Ken Schles, PPOW. 1993 July Disorderly Conduct, PPOW. 1993 January Photometro, Letter From New York, No. 38 by A.D. Coleman. 1992 May - August More Than One Photography, The Museum of Modern Art. 1991 November Arts Magazine, "Legal Fictions," Bill Jones. 1990 April 11 International Center of Photography Photographer Lecture Series Invisible City (audio in ICP library archive). 1989 April Splash, Thomas Beller. 1989 March Arts, Bill Jones. 1989 March American Photographer, Vicki Goldberg. 1989 Spring SF Camerawork, Regarding Postmodernism Volume 16 Number 1, Marnie Gillett. 1989 April VLS, Guy Trebay. 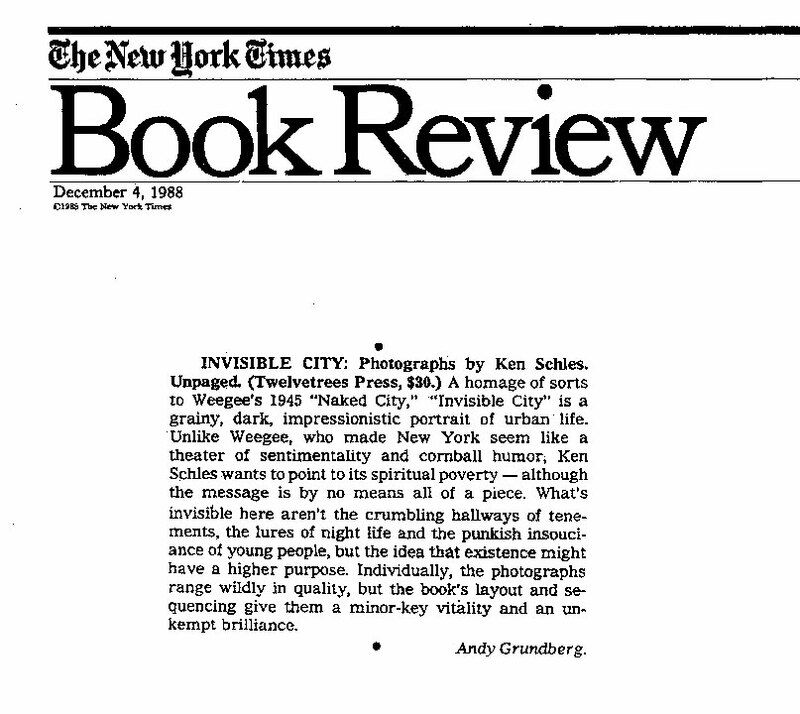 1988 December NY Times, Andy Grundberg selects Invisible City as a notable book. 1988 June 100 Years: A Tradition of Social and Political Art on the Lower East Side, PPOW. 1987 October Photomannerisms, Laurence Oliver Gallery, PA.
1987 July Art Against AIDS, NYC. 1987 June Blatent Image/Silver Eye Gallery, Pittsburgh, PA, solo exhibition. 1987 January 108 Magazine, DY. 1987 January Greathouse Gallery, NYC solo exhibition. 1986 June Palladium, NYC "Art After Midnight" group exhibition. 1986 April Arts, Dan Cameron. 1985 September Arts, Barry Schwabsky. 1985 August Art Advisory Service, MoMA, NYC group exhibition. 1985 July Civilian Warefare Gallery, NYC group exhibition. 1985 July Art City, NYC group exhibition. 1985 May Greathouse Gallery, NYC solo exhibition. 1984 Contemporary Triptychs, June Blum Art Institute Bard, Annadale-on-Hudson, NY group exhibition. 1984 May Defacto Salon, Defacto Gallery, NYC group exhibition. 1984 March Just Appearances, New Math Gallery, NYC group exhibition. 1984 March Photo-Limbo, Limbo Gallery, NYC group exhibition. 1983 June Tempest Gallery, NYC solo exhibition.